‘Life should mean life’ is a popular adage that you might overhear in a pub, on public transport, even in the queue at the supermarket. It is hard to judge how widely, or sincerely, held this belief is – but it is certainly one that most of us have come across whether it be in an abstract discussion with others, or in popular commentary of notorious legal cases. For example, each time the issue of paroled for famed offenders such as Myra Hindley has arisen most newspapers, politicians, and popular figures can be relied upon to take the stance ‘tough on crime, tough on criminals’. But who, in reality, does this benefit? When an offender is sentenced to penal servitude they disappear largely from public consciousness. Most of us are content to know that offenders are ‘behind bars’ serving their sentences. If we hear about life inside prison walls it is rarely an informative and educational tour of the daily grind of prison life. More often than not our only insight comes from an expose of the failings of the prison system, the soft treatment and shameless privileges headed upon those that ‘should be doing hard time’. Whilst as a civilised society of the twenty-first century we like to pay lip-service to the idea of penal servitude as a reformative process, prison remains, primarily, the same institution it was in the nineteenth century – a place intended for punishment. Numerous historical, criminological, and sociological studies have shown us that modern prisons and imprisonment have changed little since their creation in the mid-19th century. Original buildings are still in use, costs are not reducing, and rates of recidivism are as high as ever. There is even talk of reintroducing the uniforms and marks systems that typified the penal system in the Victorian age. But even the swiftest glance inside prison records from the period offer valuable lessons about the danger, and counter productive, nature of allowing prison to be little more than a space of despair and punishment where we place offenders and throw away the key. 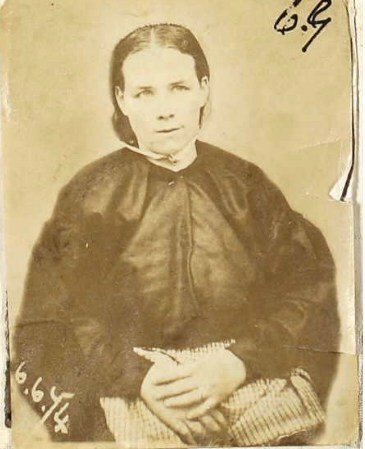 Mary Lynch was sentenced to Life imprisonment in 1872 when she grievously wounded Susan Snellgrove. She was taken from her cell in Newgate where she had awaited trial and transferred to Millbank prison to begin a sentence that was set to last for the rest of her natural life. The Victorian penal system was strictly regimented and highly repressive operating on a basis of privileges and punishments which controlled everything – what offenders ate, wore, if they could write letters and, most importantly of all, what money they would receive when they were eventually released. The message was simple: those who obeyed would serve less time and be better off when they left, those who did not would face physical and mental punishment. However for Mary, and many like her on long-term or indefinite sentences, a system of marks and merits became meaningless. With no guarantee of release (Indeed Sarah Murray, the woman convicted alongside her, died in prison) it mattered little what marks she accrued or what she ate from one year to another. Penal servitude stretched before her like an endless wasteland and left little room to hope for the future. Incentive for her to conform was minimal. The product of this is well evidenced in her prison offences record. Mary’s problems began just a few months into her sentence and signified over a decade of mental instability, self-harm, and violent conduct. Between 1872 and her eventual parole in 1885 Mary attempted suicide three times, and threatened to do so on several more occasions. She damaged prison property (including smashing 24 panes of glass) on four occasions. Mary physically and verbally assaulted prison officers and management – shouting, kicking, striking, and even in one instance, dousing with excrement – more than ten times. Mary also had numerous altercations with other inmates. In one case she harassed and taunted a young woman who had been convicted of attempting to smother her newborn baby, and made several other attempts to induce prisoners in the exercise yard to fight with her. The desire to punish serious offenders and to create a cruel and unforgiving space for them to dwell in for the rest of their days has been long standing and is not difficult to understand. But it is an idea that has gone largely unchallenged for too long. Creating a place that is a catalyst for hate, despair, and violence is not only a failure of our own age. Victorian prison records evidence that it has never worked. A ruthless environment is not only counterproductive for the prisoners most in need of change, but also highly dangerous for those that work with them or around them. Even more worryingly these kind of offenders and this kind of setting also poses a grave risk of brutalising lower-level offenders, the weak, and the vulnerable too – turning them out, back onto the streets, more damaged and desensitised then when they arrived. To change the cycle of offence, punishment, brutalisation, and recidivism, Penal servitude must become a time of support, rehabilitation, and hope. Which doesn’t sound much like a Victorian – or modern day – prison at all.